Roughly speaking, you need a stand with an average size of at least 10 inches dbh (or bigger) to get this desired mix of products to have a profitable operation in recent market conditions ($475 to $500 per MBF). Bigger trees need to use more site resources (mainly light, water and nutrients) than little trees. The resources available on any given site are limited. As a group of trees grows, it reaches a point where there are not enough resources to go around and trees begin to compete, leading to winners and losers. Eventually some trees have to die (the losers) for others (the winners) to have room to grow. What’s neat is that there is a regular and reliable pattern to this process which applies broadly to all species (when growing in groups of a single species of a similar age). There is a predictable maximum number of trees of a given size that can grow together in a group. So it follows that there is a predictable maximum average size for any given number of trees growing together in a group, according to its species. As a group of trees grows towards its maximum size for that number of trees (its spacing or density), it will pass through certain stages along the way. These stages (e.g. crown closure) or zones (e.g. self-thinning) all correspond to different and increasing levels of competition among the trees, each occurring a predictable point. See illustration below. As covered before, the idea in spacing a young stand is to have the “right” number of well-distributed trees to allow them to grow until they are big enough to support a thinning harvest and to be able to do it “on time”, before future opportunities are affected by overly-intense competition. 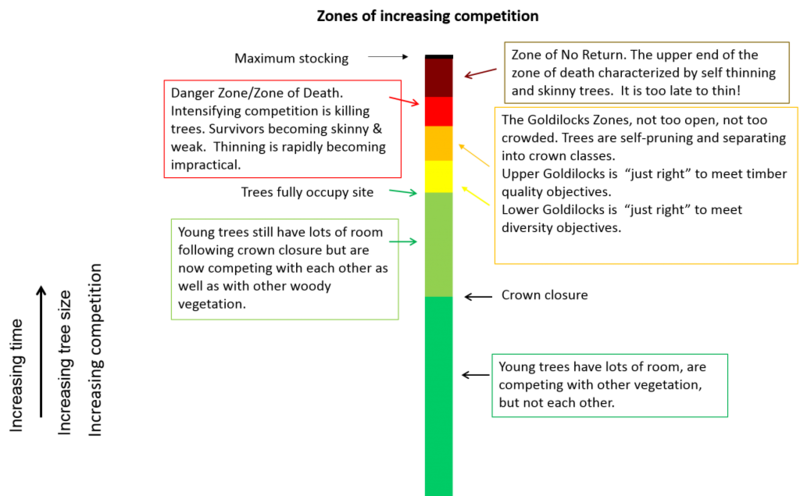 This generally means aiming to thin the stand when it is in the Goldilocks Zone (yellow or gold), and avoiding slipping into the Danger Zone or Zone of Death (red). Bad things happen in the red zone. Trees start dying, starved to death for want of resources by excessive competition among their neighbors. This is euphemistically called “self-thinning”. Self-thinning is an entirely natural process that gradually allows room for surviving trees to grow larger. But in the process live crowns get smaller, individual tree growth slows down and all the trees suffer. 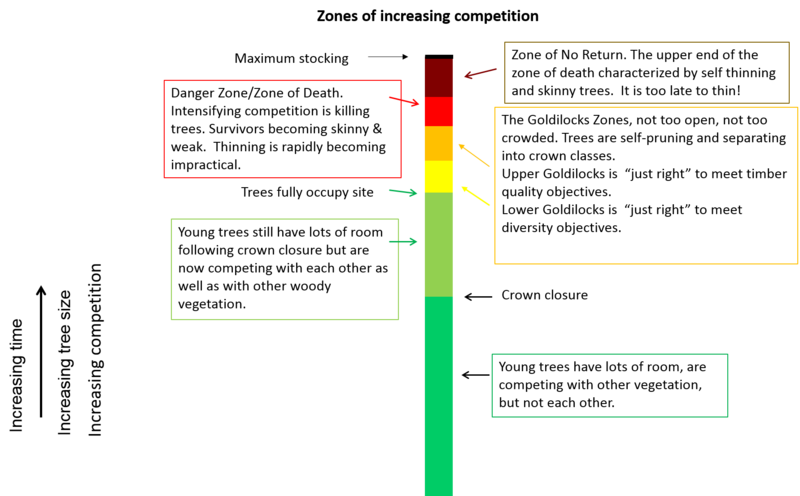 If allowed to proceed too far (approaching the brown area, the Zone of No Return), the stand becomes too weak and unstable to be thinned effectively. That leaves few options besides letting the stand grow (and self-thin) for another decade or so until it can be clear cut, then start over. This is not necessarily a bad decision, but not the outcome many family landowners are aiming for. 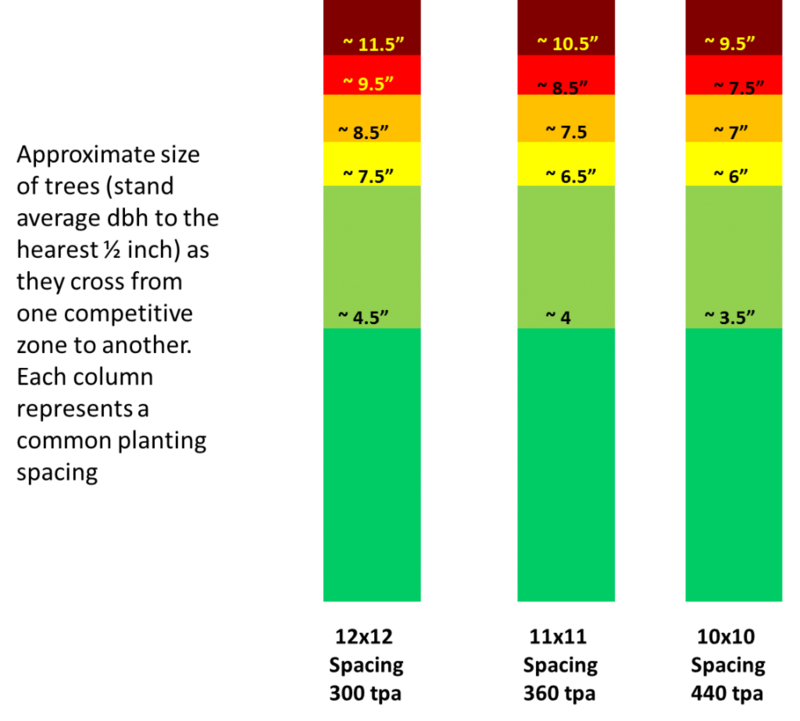 This relationship of predictable stages (commonly expressed as a ratio of the maximum) also gives us predictable average tree sizes at which different stages are reached. This lets us know if trees growing at any particular spacing will reach a given target, like the 10 inch average size needed for a breakeven thinning harvest, before becoming too crowded and stressed. 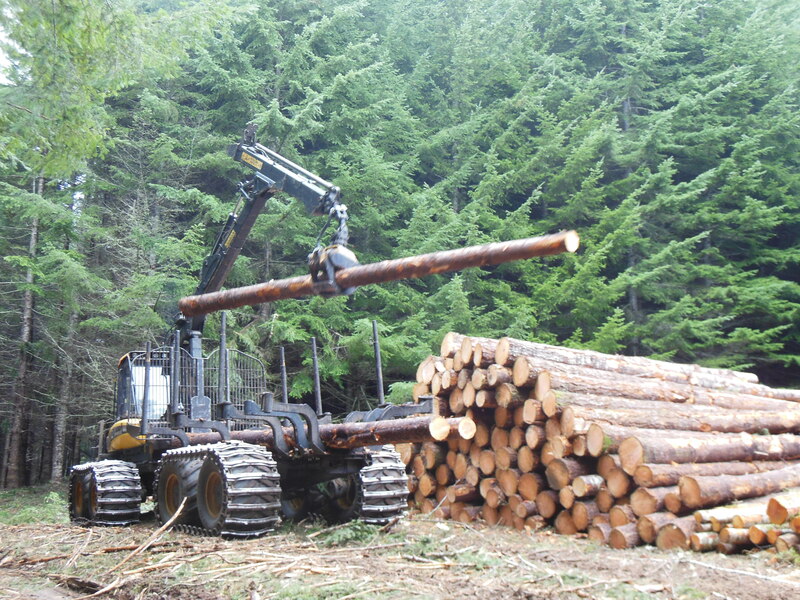 Let’s consider some young Douglas-fir stands. Growing at the commonly planted spacing of 10×10 (about 440 tpa, the column on the right), trees will just be 6” (on average) when they enter the Goldilocks Zone, and barely 8” when they are pushing up against the Danger Zone. We saw why it is hard to have a profitable operation at that size. But delaying the thinning harvest is unlikely to fix the situation, since we won’t have reached even a 10” average before approaching the brown Zone of No Return. Generally, many the trees we’d like to remove in an early thinning will be smaller than average. A delay for any reason at this spacing is likely a big step towards a short rotation. Trees planted and growing at an 11×11 spacing (360 tpa) may do a little better, growing into the Goldilocks zone at an average size of about 6½”, and reaching the red zone at about 8½”. Still well-shy of the thinning target while avoiding intense stress, but it might work for some people. So what about a still wider spacing? Trees growing at a 12×12 (300 tpa) spacing have a lot more room to grow before crowding and competition begins to undermine other management objectives. At a 12×12 spacing trees will be about 7½”, when they fully occupy the site and 10″ on average when they reach the self-thinning red zone. It is much easier to see a profitable thinning operation in this type of stand, and less temptation to delay and push beyond the upper end of the desired thinning window. But should life or market conditions mandate a delay, this spacing gives a bit more breathing room. Other advantages of this stocking level include an earlier (if small) cash flow to offset some establishment costs, fewer, larger trees to handle in the thinning harvest, and a residual stand of deep-crowned, wind firm, rapidly growing trees which provides the landowner a wider range of silvicultural options. Oh oh, so what if you planted at 10×10? Continue on to next article on the nearly-forgotten practice of young stand thinning (also known as pre-commercial thinning). This is all about tree farming. Not all small woodlot owners want to manage using the outdated agricultural model. Does OSU also give advice to forest landowners who are pursuing ecological goals? I guess I would say it is all about management, and understanding the relationship between a landowner’s goals and the process (ecology) of stand development, so that they can manage the stand to best achieve those goals, decades down the road. Yes, many or maybe most woodland owners are interested in managing for ecological goals or other values besides income, and I specifically called out common objectives including habitat diversity and recreational opportunities. Most of those are best met by an extended rotation (maybe 60 or 100 years), at lower stocking levels to allow tree and understory growth needed to provide some of the vertical and horizontal diversity which support those goals. Many people are starting out with young stands that are planted at a density that puts them on a collision course with those long term ecological goals, which we agree many folks have. Unless they recognize that and take some corrective steps, they may not get the stand conditions they need to meet those goals. So it is really that exact segment of the landowner population, the folks who are trying to raise a woodland differently from the short rotation, “industrial model”, whose attention I am trying to get. We must work within the same biological limits, and using the same tools (like density management) whether we are aiming for wood production or habitat restoration. It is the goals and objectives that make the difference, direct the management actions taken, and so separate an “agricultural model” from an ecological model. But I am not sure we are referring to the same thing here or not. Hopefully all that will come across more in the next segment of this series, about spacing, which is due to hit screens this afternoon. Brad, We are planting too many trees per acre! This is the conclusion I have come too after seeing my trees stands develop and not reach marketable size. I have expressed this to several landowners who are now planting. The industry standard has been 435 trees per acre. This spacing expects a certain amount of mortality and not doing any replanting. Involved small landowners will tend to replant dead trees, so they could plant 300 per acre, replant the mortality and get the same result. The other thing small landowners have a hard time doing is cutting/thinning their trees, especially when the trees do not have any value.